The Betlem Club, hotel in Prague Old Town, offers 21 well appointed rooms.Our Prague hotel rooms are equipped with stylish furniture which complements the historical atmosphere of our Prague Old Town hotel. The rooms on the first and second floor are more luxuriously furnished, each with a very fine bathroom. The bathrooms have a bath or shower, a hair dryer, WC, cosmetic accesories and both hand and bath towels. Each room has its own fridge, a TV set with satelite programmes and a phone for direct calling to the whole world. The attic rooms are the same as the above but smaller in size. They are also cosily furnished with wooden furniture and are offered at very favourable prices. Our Prague hotel rooms prices include a rich buffet breakfast which is served in a Romanesque-Gothic cellar dating back to the 13th century. 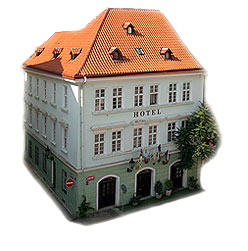 Our Old Town Prague hotel offers its own pick-up service with transport to/from the airport or railway station.